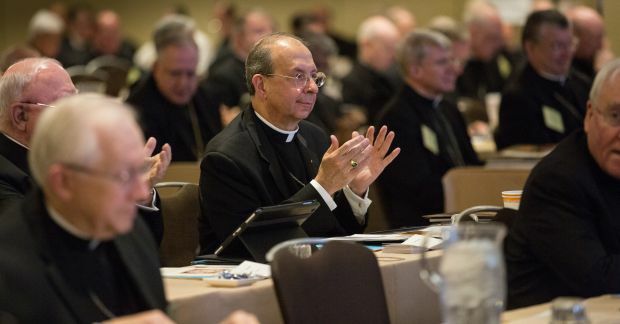 ST LOUIS (CNS) — In reports on migration-related work June 10 at their spring general assembly in St. Louis, U.S. bishops were encouraged to visit immigrant detention centers in their dioceses to better understand the conditions under which migrants are being held. Auxiliary Bishop Eusebio L. Elizondo of Seattle, chairman of the Committee on Migration, outlined efforts of the committee including issuing a report on problems with the immigrant detention system; advocating on behalf of migrants who might be eligible for asylum or other forms of legal status in the U.S.; and pushing for a dramatic increase in the number of refugees from Syria, especially, and others who are fleeing their countries because of religious persecution. In May, the U.S. Conference of Catholic Bishops and the Center for Migration Studies released a scathing report, “Unlocking Human Dignity: A Plan to Transform the U.S. Immigrant Detention System,” based in part on visits by bishops to detention centers around the country. “It’s heartbreaking to see mothers with children in these centers,” Bishop Elizondo said. “This is a violation of international law, which our nation is facilitating,” said Bishop Elizondo, adding that the committee and staff are raising the issue with the U.S. government. Last fiscal year, 68,000 unaccompanied minors and 68,000 families with children were detained by the U.S. Border Patrol. In response, the U.S. paired pressure and financial incentives on the governments of El Salvador, Guatemala and Honduras to do more to keep their people home and on Mexico to prevent the migrants from traversing that country. As a result, the number of such people crossing the border this year is down significantly, expected to hit about 40,000 in each of the two categories, said Bishop Elizondo, but among the problems of those interdiction efforts is that potential refugees are not being given the chance to seek that form of protection from being sent home. Bishop Jaime Soto of Sacramento, California, who is a member of the board of directors of the Catholic Legal Immigration Network, reported that CLINIC-affiliated attorneys have been providing legal services at the South Texas Family Residential Center in Dilley, Texas, which will have space to house 2,400 mothers and children when full. The pro-bono attorneys trying to help at Dilley “simply cannot keep up with the demand,” Bishop Soto said. Most of the people there should be eligible for asylum, and “jailing of asylum seekers is a violation of international law and a stain on the administration,” he said. Bishop Soto said CLINIC affiliates also are continuing to try to prepare people living in the U.S. to participate in deferred deportation programs. Deferred Action for Childhood Arrivals, known as DACA, which continues to offer young people a chance to remain in the United States if they arrived while children. A partner program announced by President Barack Obama in November, Deferred Action for Parents of Americans and Lawful Permanent Residents, or DAPA, would provide similar protection for potentially millions more people. But the 5th U.S. Circuit Court of Appeals has blocked the program from beginning, pending consideration of lawsuits challenging it. Bishop Soto said CLINIC also is trying to screen as many people as possible for whether they might be eligible for other forms of relief under immigration laws. He said CLINIC believes more than 1 million people could be eligible for legal immigration status under existing laws, but they don’t know it. The Catholic focus is misdirected. It should be on legal immigrants and citizens first. What they are doing now fosters and promotes more illegal immigration and this is ‘increasing’ the suffering and abuse. How much more poverty can we import and expect the government and the charities to sustain for their lifetime?